Price has moved upwards in choppy overlapping movement which is what last week’s wave count for Silver expected. I have a new wave count for you which may be more in line with Gold. 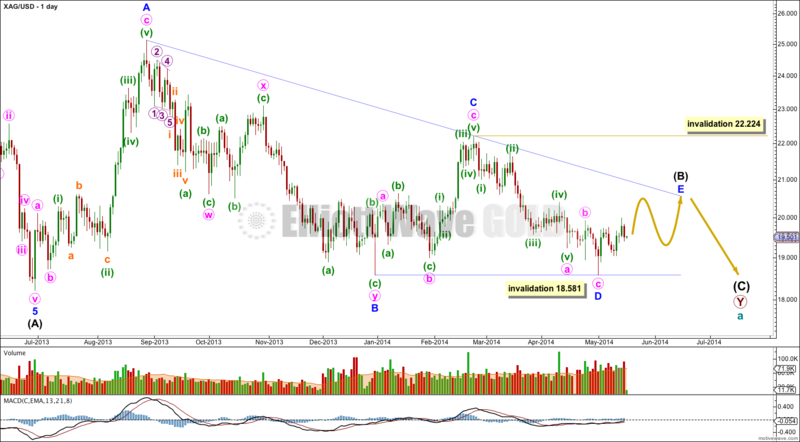 However, readers will have noted that although Silver made a new low of 18.581 on 30th April, 2014, Gold did not. Silver and Gold do not always turn at the same time, and their highs and lows are sometimes separate in time. It seems that Silver often leads Gold and may be doing so again. 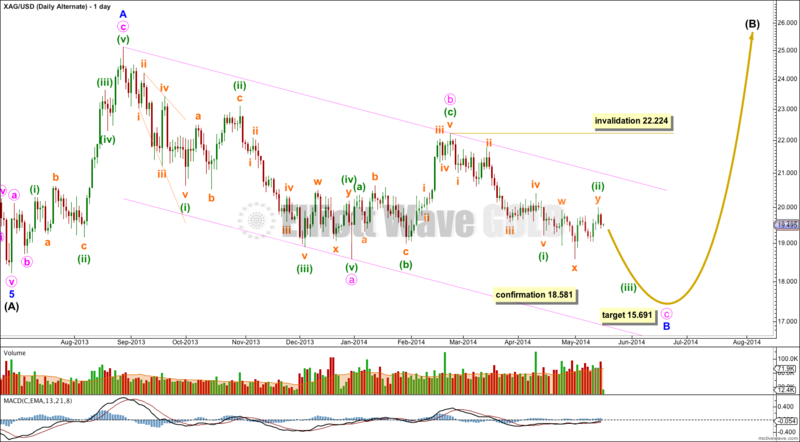 The main wave count for Silver below could still work with my main wave count for Gold. Silver may have made its slight new low on 30th April, 2014 and Gold may follow with a new low (or close to it) in a few more weeks. It still looks like a triangle is forming at the daily chart level. The triangle fits best as a barrier triangle for intermediate wave (B). The B-D trend line is almost perfectly flat. This wave count expects more choppy overlapping sideways movement with a decrease in volume, and momentum remaining close to zero, for at least another two weeks and probably longer. Within the barrier triangle minor wave D may not move substantially below the end of minor wave B. Although it looks most likely that minor wave D is complete now, it could move a little lower. As long as the B-D trend line remains flat this wave count will remain valid. Minor wave E should subdivide as a single zigzag and may not move above the end of minor wave C at 22.224. This main wave count expects price to break out to the downside once the sideways structure is complete. This breakout may yet be weeks away. Silver is within an intermediate degree B wave. Unfortunately, B waves are the most difficult of all Elliott wave structures to analyse because they have the widest variety. There are more than thirteen possible structures this B wave may take and so flexibility in analysis is essential. Intermediate wave (B) may be an incomplete flat correction. Within the flat minor wave A subdivides as a three wave zigzag. Minor wave B downwards may be an incomplete zigzag. Within the zigzag of minor wave B minute waves a and b are complete. Minute wave c would be an incomplete impulse. If price moves below 18.581 in the next few weeks then this would be the wave count I would use. At that stage the target for downwards movement to end would be 15.691 where minute wave c would reach equality in length with minute wave a. This alternate wave count expects to see an increase in downwards momentum in the very short term as a third wave unfolds. If this wave count is correct then it should be confirmed with downwards movement within the next two to three weeks. Price should find support and resistance at the pink trend lines about minor wave B on the way down. Within minute wave c minuette wave (ii) may not move beyond the start of minuette wave (i) above 22.224. Yes, and I’m swapping my main and alternate over today. I’ve done the analysis for this weekend, its being proofed and published for me. The alternate (now a main) fits nicely with Gold; both expect a third wave down early next week.